Sport nutrition helps to enhance the performance of athletes by providing specific type of nutritional food with precise quantity. Sport nutrition products mainly consist of energy supplements, recovery supplements, and performance enhancing supplements. Athletes and bodybuilders are the major end users of sport nutrition products that are enriched in essential nutrients such as carbohydrates, proteins, vitamins, and minerals. Manufactured in convenient forms and compositions, these products are distributed through numerous channels. The sport nutrition market is expected to witness significant growth, owing to increasing sport activities and rise in strategic marketing activities undertaken by key manufacturers to build a larger consumer base. Increasing demand for functional food supplements, fitness awareness among people, and government healthcare campaigns are some of the factors that contribute to growth of the global sport nutrition market over the forecast period. However, ingredients used in sport nutrition products are imposed with stringent regulations, which is major factor hindering growth of the market. Such regulations are a key challenge for manufacturers to launch their products in a competitive market. The Food and Drug Administration (FDA) has stringent guidelines and regulations regarding entry of nutritional products in the market such as ban on ingredients such as anabolic steroids, prohormones, and stimulants. Among product type, the sport drinks segment accounted for the largest market share in 2016 and is expected to retain its dominance over the forecast period. Sport nutrition drinks are preferred by consumers, owing to increasing promotion of such drinks as healthier alternative to soda and mental and physical benefits associated with the consumption of sports drinks. Electrolytes and carbohydrates prove beneficial in energizing those engaged in physical activities such as football and marathon training. Sports drinks reduce fatigue and replace electrolytes that are lost in sweat during sport activities. However, excess consumption of sports drinks can result in tooth decay, as it contains citric acid, which causes erosion of tooth enamel. Moreover, the presence of carbohydrates can result in excessive calorie intake, which results in increasing incidences of obesity among adolescents. Health conscious consumers are looking for alternatives for sport drinks, which in turn, is expected to hamper growth of the market. North America held a dominant position in the global sports nutrition market, accounting for a share of more than 30% in 2016 and is expected to retain its dominance over the forecast period. The sports nutrition market in North America was valued at US$ 9.53 billion in 2016, projecting a CAGR of 4.39% during the forecast period from 2017 to 2025. U.S. is accounted as the major contributor to the growth of the North America sports nutrition market. According to the National Collegiate Athletic Association (NCAA), in U.S., over 460,000 student athletes compete in more than 2 sports activities every year. Asia Pacific is expected to be the fastest growing region, witnessing the highest CAGR of 8.21% during the forecast period. Countries such as China, Japan, South Korea, Malaysia, and India, are the major contributors to the growth of the market. Owing to the strengthening economic condition of the emerging economies in the region such as India and China among others, international manufacturers operating in the sports nutrition market and its subsequent industries are looking to penetrate this region for better expansion opportunities. For instance, in 2017, Roquette, a global leader in innovative plant-based ingredients, opened new offices and an innovation center in Singapore, thereby, increasing its focus on the nutritional and health challenges in the region. According to a study by Coherent Market Insights, the global sports nutrition market was valued at US$ 27.85 billion in 2016 and is expected to witness a CAGR of 6.64%, in terms of revenue, during the forecast period from 2017 to 2025, to reach US$ 48.87 billion by 2025. 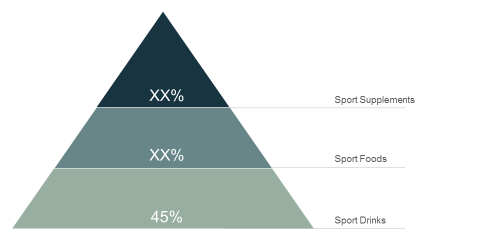 Among product type, sport drinks segment held highest revenue share of 45% in the global sports nutrition market in 2016 and is projected to maintain its dominance over the forecast period. The major players operating in the global sports nutrition market include GlaxoSmith & Kline Plc, Maximum Human Performance LLC, Glanbia Nutritionals, Optimum Nutrition (ON), Bio-Engineered Supplements and Nutrition, Inc. (BSN), Abbott Nutrition, PepsiCo, Hormel Food Corporation, and GNC Holdings Inc.
Key players are strategically investing in the sports nutrition market to enhance their product sales through business strategies. For instance, in 2016, Maximum Human Performance (MHP) has introduced an all-new pro athlete team to showcase its revitalized flagship brand to young athletes across the globe, which is launched along with MHP’s fully transparent new formulations. Sport nutrition products comprises of sport drinks, food, and supplements which are rich in essential nutrients such as proteins, vitamins, minerals, and carbohydrates. These products are mainly consumed by athletes and bodybuilders to replenish nutritional requirements pre and post work-out. Moreover, other than athletes and bodybuilders, recreational and lifestyle users also use sport nutrition products to enhance physical and mental performance. Increasing number of sport clubs and fitness center driven by grooming trend in both youngsters and adults are expected to fuel demand for sport nutrition products over the forecast period. The increasing focus on developing sport infrastructure along with the favorable government initiatives to promote sport activities across region is projected to fuel growth of the global sports nutrition market over the forecast period. North America held the largest share in 2016 and is expected to retain its dominance over the forecast period. This is mainly due to large presence of manufacturers of sport nutrition products in the region. However, Asia Pacific is expected to witness the fastest growth rate during the forecast period, owing to increasing fitness awareness fuelled by rapid adoption of the western culture in emerging economies such as India and China among others. This in turn, is projected to fuel demand for sport nutrition products in the region during the forecast period. Owing to increasing utilization of functional sport drinks as a readily available instant source of energy, sport drinks segment is expected to hold dominant position in the global sports nutrition market over the forecast period. Key companies covered as a part of this study include Maximum Human Performance (MHP), Glanbia Nutritional, Optimum Nutrition (ON), Bio-Engineered Supplements and Nutrition, Inc. (BSN), Abbott, PepsiCo, CytoSport, and GNC Holdings Inc.
*Browse 200 market data tables and 70 figures on "Sports Nutrition Market Market - Global forecast to 2025”.